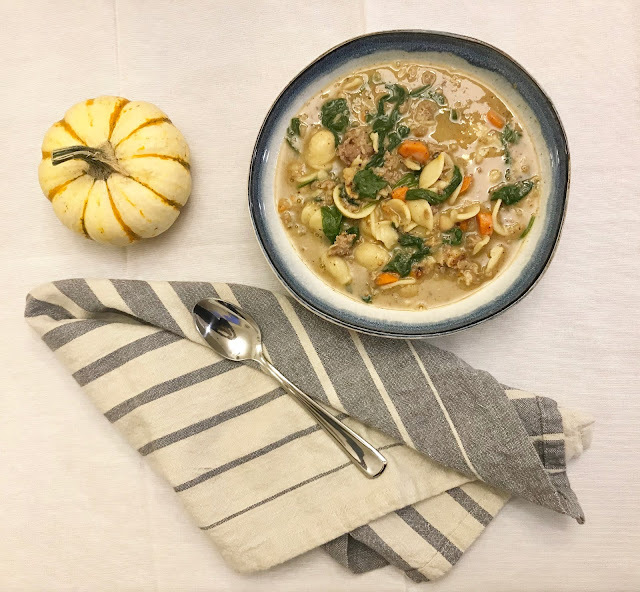 This is by far my favorite soup to make in the winter. It is the definition of comfort food. Let me preface this by saying I work from home and cook this soup all day long because I can take small breaks to chop and stir. I have seen versions of white bean soup that can be done in 30 minutes, if I was making this soup in 30 minutes I'd leave out the carrots because I don't think they would get soft enough. There are ingredients that can be changed out or added depending on your preference, the sausage can be left out completely or interchanged for chopped tomatoes or chicken sausage or faux meat sausage. Also I make this soup with kale instead of spinach often, I just add it at a different time in the cooking process. And of course the cheese is optional. 1. 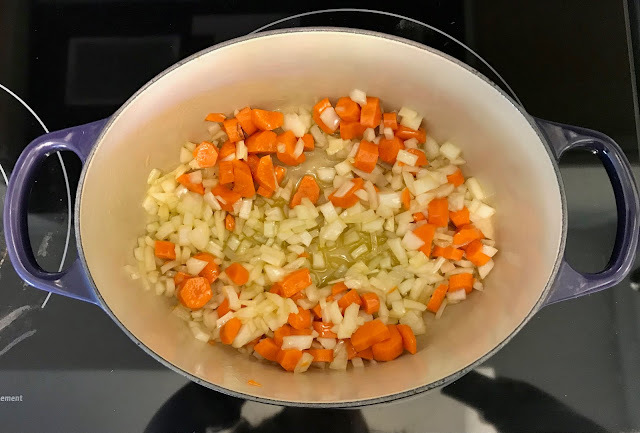 Chop the onion and the carrots and throw them in a heavy pot on low with the olive oil, my pot is this one (if I was using kale I would add it in this step). I let this cook sometimes for a half an hour to get the carrots soft but be careful nothing burns and stir often. 2. Add the sausage by squeezing them out of their casing and chopping it up with a wooden spoon. Once the sausage has cooked to a point when their is no pink left I add the beans with the bean liquid and add two canfuls of water. To add a creamy texture to the soup, mash the beans while I stir with my wooden spoon, this time I even used a fork to mash the beans. I don't mash all of the beans so that the soup still has whole beans and partial beans. Some white bean soup recipes recommends that you throw the beans in the blender but I like the bean chunks. I let this mixture sit on low for a while, about an hour, so that all the flavors really combine well. 3. Add the pasta with another can of water. I like to use water instead of broth but vegetable or chicken broth can also be used. 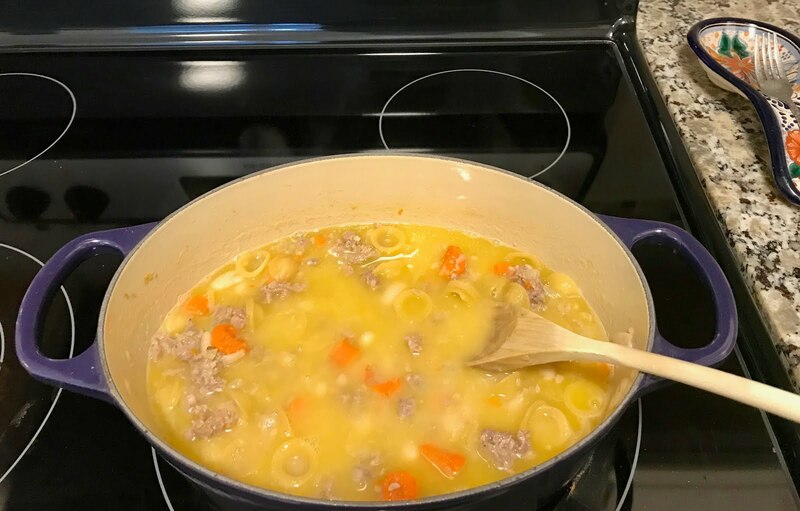 Now here is where you have to keep an eye on this soup, because the pasta can get stuck to the bottom of the pot if you don't stir often. Also if you see the pasta is really sucking up all the liquids just add more. 4. After about an hour of cooking on low I add the spinach, salt and pepper to taste, I used about 2 teaspoons of each. 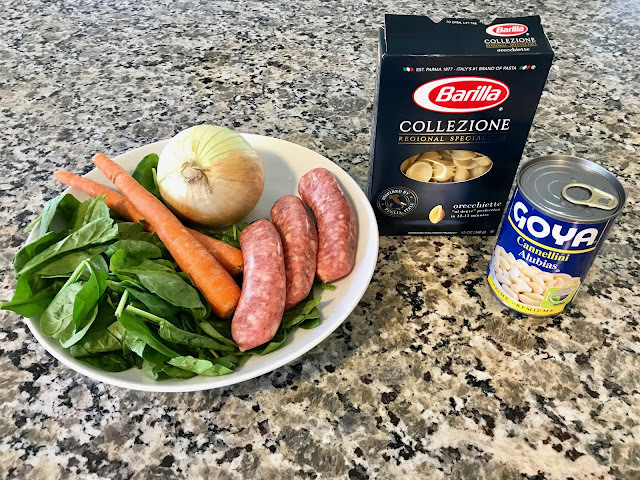 The spinach will cook down almost instantly and soup is ready to eat, if you want sprinkle some parmesan cheese in and serve nice and hot.